Our planet is full of fascinating flowing fluids. Jack Whitehead has investigated all sorts of them around the globe—hardly ever leaving his laboratory. There’s the once-mysterious Alborán Gyre, for example, an unusual swirling current in the Mediterranean Sea that looks like a bulls-eye on maps and acts like a washing machine in the ocean. Or, the relatively fresh water that pours out of the Baltic Sea into the Skaggerat and noses along the south coast of Norway, floating above saltier, heavier North Sea water. Or, the cold, dense masses of water that shrug along the ocean bottom, occasionally hitting a mountainous seafloor “bump,” rising up, and cascading down the other side, like waterfalls within water. Not all of the fluid environments Whitehead has explored have been made of water. He also demonstrated how plumes of molten rock deep within the planet could rise buoyantly like hot-air balloons to Earth’s surface and erupt to pave the seafloor with new crust and create islands such as Hawaii. “I explore the basic principles of how fluids move on the dynamic Earth,” said Whitehead, summarizing his four decades of research. All very fascinating stuff, of course, but … well, it was January in New England and suddenly I felt clammy when he mentioned something about flows with “abrupt transitions” that involve “supercritical points” and “chaos theory.” Would Whitehead, a scientist at Woods Hole Oceanographic Institution (WHOI), start speaking in thermodynamic tongues and scratching out mathematical equations stretching from here to the Berkshires? Whitehead has always preferred a hands-on approach to solving scientific mysteries. In the Geophysical Fluid Dynamics (GFD) Laboratory at WHOI, he sets up experiments using real materials: water, salt, wax. He puts water-filled plastic containers, representing oceans, on spinning turntables that simulate Earth’s rotation. In some experiments, pieces of plastic function as straits and continental shelves; in others, metal cylinders might serve as lava tubes. He adds heat when called for—not from Earth’s core, but real heat nonetheless—and colorful dyes to make fluid flow visible. “For me, it starts in the lab, and you use all of your senses, except taste,” Whitehead said. The experiments effectively distill complicated processes down to the fundamental forces of physics that generate them. The GFD Lab that Whitehead helped establish is still going strong today, used by many scientists to expose phenomena on a small scale that are impossible to observe in the larger real world. That’s because the ocean isn’t a big bathtub of homogenous water. It has masses of cold or saltier water that are heavier than warm or fresher water; the former sinks to the depths and the latter stays on the surface. A major force driving ocean circulation is the difference in density between one water mass and another. Take the case of the strange Alborán Gyre. Scientists could not figure out how and why it formed until Whitehead conducted one of his classic experiments. He re-created the gigantic gyre in the western part of the Mediterranean Sea in miniature in the lab. He used a container of fresh water, partitioned into two basins. He mixed in salt (and black dye) to one side, representing the salty Mediterranean; the fresh, clear water on other side represented the much less salty Atlantic Ocean. The basins were connected by a narrow channel (the Strait of Gibraltar), blocked by a sliding door. Whitehead rotated the entire apparatus to simulate the force caused by Earth’s rotation, called the Coriolis force. He slid open the door to allow the fresh water to swoosh into the salty stuff. Voila!—a clear ribbon of water spiraled clockwise out of the narrow chute onto the surface of the dark idealized Mediterranean. The Atlantic and Mediterranean waters don’t mix seamlessly. Fresher, lighter Atlantic water rises up and over saltier, heavier Mediterranean water. The Coriolis effect causes this freshwater ribbon to spin off in a gyre above the denser water below. Similar gyres are found in many areas where freshwater plumes leave bays or inland seas; knowing where and why they form has helped us understand this facet of ocean circulation and, among other things, to track the movements of fish, submarines, and spilled pollutants within them. What makes Earth’s tectonic plates move? Whitehead came to WHOI in 1971, attracted partly because it had become a hub for the nascent field of geophysical fluid dynamics. The term “GFD” was coined by a group of scientists and students that began gathering each summer since 1959 at WHOI for a fellowship program to exchange ideas in the different scientific disciplines that deal with the dynamics of fluids in oceans, atmospheres, and the interiors of planet. One way or another, a sizable proportion of the world’s leaders in the field of GFD have come through the program. Whitehead has been a fixture in it for the lion’s share of that history. Whitehead said the early 1970s “was an incredibly stimulating time.” The theory of plate tectonics was red hot. Scientists had just begun to understand that Earth’s surface was carved up into individual segments, or plates, that moved apart or collided, forming ocean basins and mountain ranges. But what fueled the plates’ movement? While many scientists got out their pencils and paper to derive complex mathematical equations that would explain plate tectonics, Whitehead ran straight to the lab. He poured fluids with different viscosities into containers that he heated. He snapped photos of the action. Thin, worm-like streams of less dense fluid rose buoyantly within denser fluid toward the top of the containers—much the way boiled water rises to the top of the pot and hot air rises. The process is called convection. Near the top of Whitehead’s containers, streams of the less heavy fluid expanded outward like balloons at the end of straws. The experiment demonstrated how less dense material in Earth’s hot mantle forms “mantle plumes” with bulbous heads. The plumes can cause hard ocean crust above them to spread apart, forming a chain of volcanic mountains between diverging tectonic plates. In some instances, plumes can burst through plates to create volcanic island chains like the Hawaiian Islands. The wellspring of ideas has never run dry. In recent years, Whitehead has investigated how dense water at the ocean bottom can mix back up toward the surface to close the loop of global ocean circulation. And he has examined how far hot lava can rush through cold, tubular channels within volcanoes before it solidifies into rock. Perhaps not surprisingly, outside the lab, Whitehead tended toward fluid and dynamic hobbies: music and marathons. He started training for marathons at age 45 and still runs them. And he plays the trombone in the Falmouth Town Band, which is conducted by his wife Lin, who is head of the music department in the Falmouth public school system. Though he officially retired and became a scientist emeritus in 2008, you can still find Whitehead most days in his office or lab. “There are many projects I’d like to do that I haven’t done yet,” he said, his eyes gleaming. Jack Whitehead’s research has been funded by the Office of Naval Research, the National Science Foundation, and the Paul M. Fye Chair for senior scientists at WHOI. 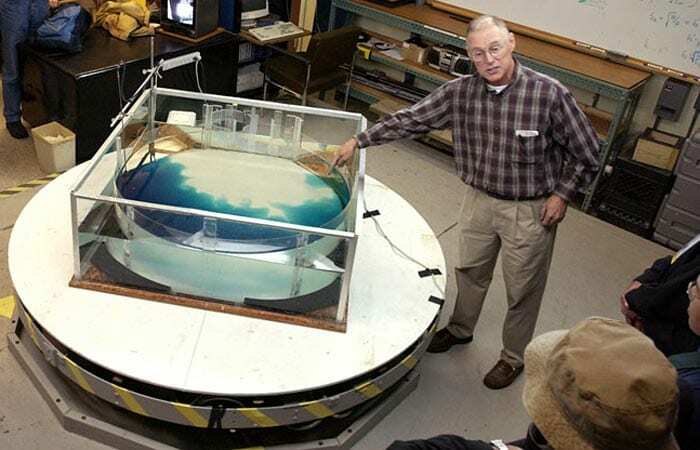 In the Geophysical Fluid Dynamics Lab he helped establish at WHOI, Jack Whitehead sets up experiments that effectively simplify complicated processes down to the fundamental forces of physics that generate them. 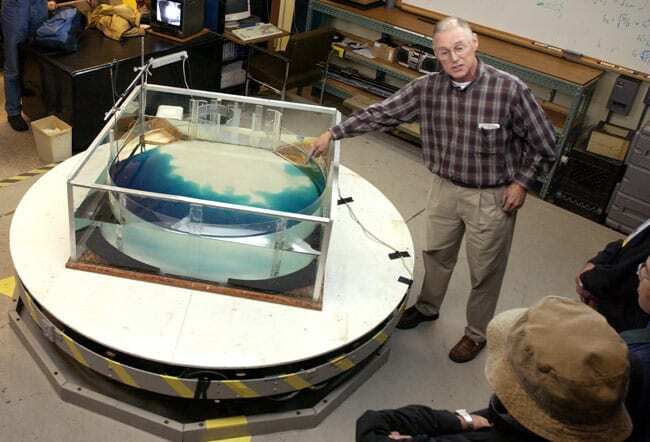 In this case, colored dyes help track the flow of distinct water masses on a rotating table, which simulates the force caused by Earth's rotation. The Geophysical Fluid Dynamics Lab at WHOI is a nexus for scientists exploring, and teaching, the basic principles of how fluids move on the dynamic Earth. 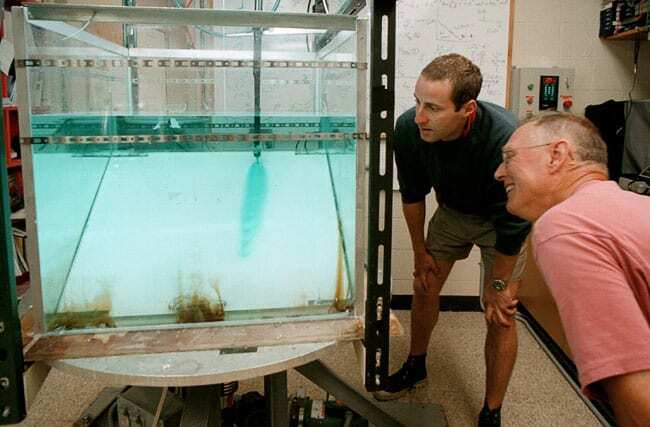 "We not only make the experiments to teach ourselves, but also to learn together with others," said Whitehead, examining an experiment with visiting student Tomasso Ascarelli (right). In the 1970s, Whitehead partitioned a container of fresh water into two basins. He mixed in salt and black dye on one side (left), representing the salty Mediterranean Sea; the clear, fresh water on the right side represented the much less salty Atlantic Ocean. The basins were connected by a narrow channel (the Strait of Gibraltar), blocked by a sliding door. Whitehead steadily rotated the entire apparatus to simulate Earth's rotation, and when he slid open the door, a gyre of clear water spiraled clockwise out of the narrow chute onto the surface of the idealized Mediterranean. The experiment solved the mystery of why the real-life Alborán Gyre forms in the western Mediterranean. In the early days of the plate tectonic theory, Whitehead devised an experiment heating fluids with different viscosities in plastic containers to simulate hot material in Earth's mantle. Thin, worm-like streams of less dense fluid rose buoyantly within denser fluid toward the top and expanded outward like balloons at the end of straws. The experiment demonstrated how “mantle plumes” form. The plumes can cause hard ocean crust above them to spread apart, forming a chain of volcanic mountains between diverging tectonic plates. 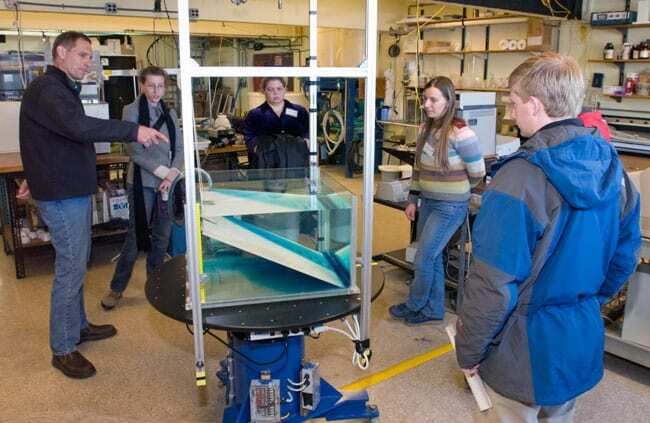 WHOI physical oceanographers Karl Helfrich (left) and Claudia Cenedese (striped sweater) demonstrate to student visitors how denser waters sheet down slanted surfaces (such as, on a larger scale, a continental slope). 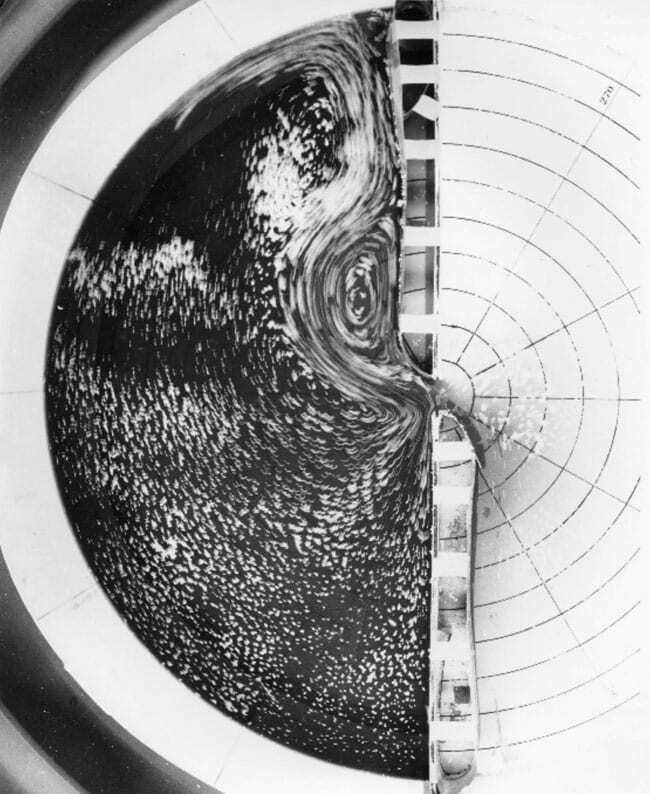 Whitehead has collaborated with Cenedese to study eddies—swirling masses of water that are pinched off currents and remain intact as they travel through the oceans. With Helfrich, he has explored solitons—a solitary waves, or pulses of water, that can travel long distances through fluids, maintaining their shapes and speeds. The phenomenon occurs in water and in light. 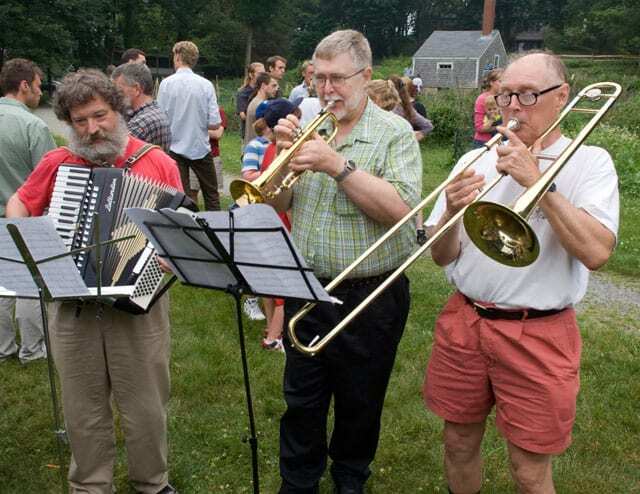 At a celebration for the 50th anniversary of the Geophysical Fluid Dynamics Program at WHOI in 2008, Jack Whitehead (trombone) joins a trio with accordionist Raymond Pierrehumbert, the Louis Block Professor in Geophysical Sciences at the University of Chicago, and trumpeter Bob Katcher, a systems analyst at WHOI. A conversation with Joe Pedlosky in Oceanus magazine.